Business and community leaders gathered for the annual meeting of the Scioto Foundation. 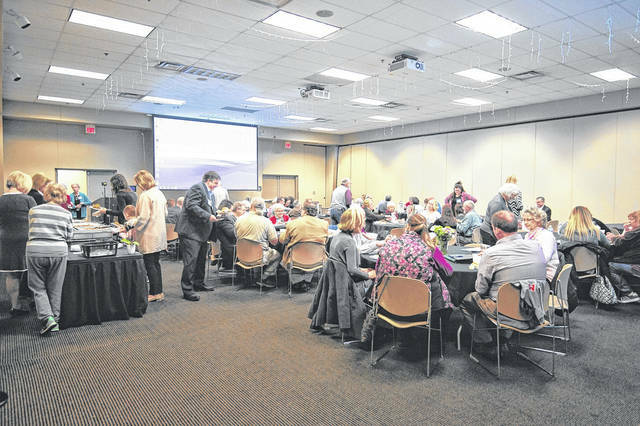 Donors, representatives from local nonprofit organizations and schools, and community leaders came together Tuesday at the SOMC Friends Center for the Scioto Foundation’s annual meeting where they heard about the Foundation’s 2017 accomplishments and looked ahead to future directions. Highlighted at the luncheon was special speaker Torey Hollingsworth, manager of research and policy at the Greater Ohio Policy Center, who presented her current work on understanding the challenges and opportunities for revitalizing Ohio’s small and mid-sized legacy cities. Portsmouth is one of 20 such legacy cities defined as older, industrial urban areas that have experienced significant decline in population and jobs resulting in diminished service capacity and resources. According to the Greater Ohio Policy Center, Ohio’s smaller legacy cities account for more than a quarter of the state’s economic output. Hollingsworth cited the need for convening local leaders to identify strategies and policies that will support these cities’ long-term strength as she described successful case studies in Lancaster, Pa., and South Bend, Ind. Welcoming annual meeting guests, former Scioto Foundation board member and past chairperson Debra Esham recognized and thanked those in attendance, as well as other board members, volunteer committee members and staff. Former board member and past chair Josh Howard gave a review of the Scioto Foundation’s achievements in 2017. As of December 31, 2017, the Scioto Foundation’s assets were $37,558,698, and $3.79 million was received as contributions during the past year. Twenty-three new funds were established, and $1.2 million was paid out in grants, disbursements and scholarships, according to Howard. Endowed scholarship funds for area Scioto County school systems established at the Scioto Foundation through the UCAN (University/College Network Access) program now total $2,389,148.38. In addition to the 12 Scioto County school districts, that total includes funds set up by Manchester, Wellston and Jackson schools in the UCAN Neighbors program. Howard called attention to the Clay School System, whose endowment leads in value with $280,917.19. In 2017, UCAN scholarship awards equaled $66,154, while the Scioto Foundation awarded $402,436 in scholarships. During the past year, the Foundation also continued its AP UCAN program by awarding 12 grants to local school districts for a total of $12,000 used for AP and pre-college testing expenses and teacher stipends for AP course certification. In a new 2017 program, 11 upperclass undergraduate-level interns were placed with host sites in Portsmouth for five weeks in the summer where they gained meaningful work experience and learned about the public and nonprofit sectors. A second year of the intern program is planned for this summer. 2017 marked the fifth year of the Scioto Gives one-day online matching gift program benefitting local participating organizations in Scioto County. The project raised a record total of $125,449, including $95,994 by 35 nonprofits combined with a $30,000 match from the Scioto Foundation. Scioto 365, another new initiative established by the foundation, was launched in January 2017 with the goal of creating impact grant-making focused upon building strong communities through community and economic development. Donors become members by giving $365 – a dollar a day – to make the community better. The member leadership of Scioto 365 creates annual case points or “themes” in which they would like to invest and vote to determine which grants to award. In 2017, Scioto 365 raised $43,318. More than half — $23,318 — was invested in an endowment to keep the fund growing, while $20,000 was awarded to Connex, Inc. for its Project ROMP, improvements to Mound Park. Scioto Foundation Executive Director Kim Cutlip announced that the theme for 2018 Scioto 365 Requests for Proposals is “Pride of Place,” based on positive aspects of the community and built upon current community assets. More information about Scioto 365 may be obtained by contacting the Scioto Foundation at 740-354-4612 or by email at info@thesciotofoundation.org. In her closing comments, Cutlip mentioned several important dates for upcoming Scioto Foundation programs including the annual scholarship luncheon on June 14; Scioto Gives, set for Oct. 18; UCAN College Night, tentatively scheduled for Oct. 24; and the fall reception for Scioto Gives and Scioto 365 on Nov. 1.
https://www.portsmouth-dailytimes.com/wp-content/uploads/sites/28/2018/04/web1_DSC_2395-1.jpgBusiness and community leaders gathered for the annual meeting of the Scioto Foundation.